Birmingham is a city in the West Midlands region of England in the UK. As of 2005, Birmingham had an estimated population of 1,001,200. People from Birmingham, are known throughout the UK as "Brummies", after the city's nickname of "Brum". Birmingham lies within the West Midlands conurbation, the third largest urban area (after the Greater London and Greater Manchester urban areas) in the United Kingdom. People from Birmingham are nicknamed "Brummies", and the city is nicknamed "Brum". These names derive from the area's distinctive dialect of English, known as Brummagem. Birmingham historically grew as a manufacturing and engineering center. Today however, the city's economy is dominated by the service sector, including public administration, education, health, as well as financial services such as banking, finance, and insurance. Additionally, tourism forms an increasingly important part of Birmingham's economy. 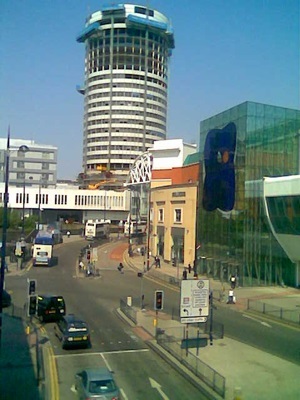 Birmingham also has a large retail sector, including the United Kingdom's busiest shopping center (the Bull Ring), and Britain's largest department store outside of London (House of Fraser on Corporation Street). Birmingham is a major transport hub on road, rail, and canal networks. Birmingham is served by four motorways (the M5, the M6, the M40, and the M42), and is home to Britain's most famous motorway junction: Spaghetti Junction. Birmingham Airport is just 6 miles (10 kilometers) to the East of the city center. Balti, a type of curry, was invented in Birmingham. If you visit Birmingham, and you want to try this, then you should probably visit The Balti Triangle - an area South of the city center, around Ladypool Road, Stoney Lane and Stratford Road, where many Balti houses are located. Discover the best parts of the must-see cities in Great Britain. Learn the top sights and attractions before you travel with this comprehensive guide. Planning a trip to England, Scotland or Wales? Great choice! If you're considering anything from a short stay to a long trip, Great Britain will provide you with some of the most amazing sights and scenes to be found anywhere. You'll fall in love with Great Britain's diverse landscape, ancient castles and unparalleled culture. To get the most out of your British adventure, you must be well prepared and have some basic knowledge about the country: where to go, what to see and what to do! If you enter Great Britain unprepared and unaware of the many treasures to be discovered and enjoyed, you will not be able to enjoy it to its fullest. Without the knowledge of exactly what every must-see city has to offer, you will ultimately waste your valuable vacation time planning your next steps instead of discovering exciting, new sights. In this Great Britain Travel Guide I will give you the best tips and advice that will enable you to get through your British adventure smoothly, and help you to enjoy it to the fullest! I'll provide you with the essential sights and attractions for all of Great Britain's major cities, so that you don't have to waste any of your own time finding out what each city has to offer! You'll have the most concise, valuable Great Britain Travel Guide – the country’s sights, culture and attractions - at your fingertips every step of the way. So what are you waiting for? Take action now and enjoy the trip of a lifetime! Want an easy-to-read travel guide to Birmingham? This book shows the top 194 spots in this unique destination in United Kingdom. Local Love Travel Guides work exclusively with local travel experts to guide and help you make the most of your vacation. Birmingham Top 194 Spots is your menu to all the 'must-visit' spots in this destination in United Kingdom. Quickly get the lay of the land, understanding all your day, food and night-life options. Enjoy your days at places like: Hotel du Vin & Bistro, Birmingham New Street Railway Station (BHM), Touchwood Shopping Centre, Jewellery Quarter... amongst 87 more spots. Enjoy local cuisine at top notch restaurants like: Touchwood Shopping Centre, Bullring Shopping Centre, Tom, Hotel Indigo Bistro... amongst 55 other spots. Party at local hangouts like: Birmingham Hippodrome, Alexandra Theatre, Hotel Indigo, Brindleyplace... amongst 32 more nightlife spots. This guide also covers Birmingham spots like shopping areas, museums, parks,outdoor adventures, nightclubs and street foods. And a quick explanation as to why it deserves a visit. No needless fluff, no boring anthropological lessons! Just everything we love! We don`t stuff our travel content with working hours, credit-cards accepted, nearby transportation and user-reviews as it tends to bulk up the writing and are subject to change since the time of publishing. Once you decide the places you want to visit, these infos can easily be found at your hotel concierge, on-line or on Google Maps. Similarly, our philosophy has been that user-reviewed travel sites are subjective, as they tend to top-rank places that manage their reputation on those sites. So little corner bakeries, unique shops by local artisans, secluded beaches and hidden bars don't show up in those sites as visibly as places that have an on-line marketer or social media specialist. Similarly, we believe the opinion of one well-informed local expert should outweigh the opinion of hundreds of first-time visitors to Birmingham. First-time visitors tend to flock to famous tourist attractions, creating a vicious circle, accentuating just the popular places. Our local experts know the entire city, and know what deserves a visit, whether a famous attraction or a quaint corner. Birmingham Top 194 Spots is the first travel guide to Birmingham you need to read. It quickly helps you define your short-list of places you want to visit, so you don`t have to spend hours reading hundreds of pages of dense writing. All for less than the price of a sandwich. The number 1 choice for all users of the inland waterways. This established, popular and practical guide covers the canals and waterways around Birmingham and central England. Covered in this guide are: Ashby Canal; Birmingham Canal Navigations (Main Line); Birmingham & Fazeley Canal; Coventry Canal; Erewash Canal; Grand Union Canal (Main Line, Leicester Section and the River Soar); Oxford Canal, North; Staffordshire & Worcestershire Canal, North; Stratford-on-Avon Canal, North; Worcester & Birmingham Canal, North; and the Trent & Mersey Canal. The detailed Ordnance Survey® maps clearly show the location of essential features such as locks, towpaths and boating facilities, as well as pubs, shops and restaurants in the area. There are comprehensive navigational notes and descriptive text on the history of each canal, and on local services and places of interest, for which postcodes are included – ideal for use with sat-navs. This practical A5 guide features 'lie flat' spiral binding and 'book mark' back cover flap for ease of reference. In print for over 40 years, the Collins/Nicholson guides to the waterways have always been a vital part of journeys along Britain’s canals and rivers. These bestselling guides are designed for anyone and everyone with an interest in Britain’s inland waterways – from experienced boaters to those planning their first boat trip, as well as walkers, cyclists and visitors. Nicholson's – The bestselling guides to Britain's Waterways. Birmingham part of Great Brittain which is one of the most powerful countries in the world. Comprising of four Nations, it is without a second thought, the most popular country to spend your holidays with your loved ones. Right from the great food of different cultures to various exotic and thrilling tourist spots, this is the dream destination for the majority of the people all around the world. This country has a great diversity of culture and modernity which makes this place a must visit for each and everyone at least once in their lifetime. Situated in the North Western region of Europe, the United Kingdom gives you the birthplace of some of the most renowned personalities ever born in this world. So without delay check out this fascinating nation and explore the several amazing landmarks, natural scenery, museums and other places of sightseeing with your family and friends. Have a great trip! When you download Birmingham: Cities, Sights & Other Places You Need To Visit you will be well prepared to visit the country of your dreams! Buy this book today! Manchester part of Great Brittain which is one of the most powerful countries in the world. Comprising of four Nations, it is without a second thought, the most popular country to spend your holidays with your loved ones. Right from the great food of different cultures to various exotic and thrilling tourist spots, this is the dream destination for the majority of the people all around the world. This country has a great diversity of culture and modernity which makes this place a must visit for each and everyone at least once in their lifetime. Situated in the North Western region of Europe, the United Kingdom gives you the birthplace of some of the most renowned personalities ever born in this world. So without delay check out this fascinating nation and explore the several amazing landmarks, natural scenery, museums and other places of sightseeing with your family and friends. Have a great trip! The kingdom of Great Britain is one of the most powerful countries in the world. Comprising of four Nations, it is without a second thought, the most popular country to spend your holidays with your loved ones. Right from the great food of different cultures to various exotic and thrilling tourist spots this is the dream destination for the majority of the people all around the world. London is part of Great Britain. This city has a great diversity of culture and modernity which makes this place a must visit for each and everyone at least once in their lifetime. Situated in the North Western region of Europe, the United Kingdom gives you the birthplace of some of the most renowned personalities ever born in this world. When you download Great Britain: 2 Books- Places You Need To Visit in Great Britain & London you will be well prepared to visit the country of your dreams! Buy this book today! Manchester is part of Great Britain. This country has a great diversity of culture and modernity which makes this place a must visit for each and everyone at least once in their lifetime. Situated in the North Western region of Europe, the United Kingdom gives you the birthplace of some of the most renowned personalities ever born in this world. Birmingham part of Great Britain. Right from the great food of different cultures to various exotic and thrilling tourist spots, this is the dream destination for the majority of the people all around the world. Situated in the North Western region of Europe, the United Kingdom gives you the birthplace of some of the most renowned personalities ever born in this world. When you download Great Britain: 4 Books - Places You Need To Visit in Great Britain, London, Manchester & Birmingham you will be well prepared to visit the country of your dreams! Buy this book today! When you download Great Britain: Cities, Sights & Other Places You Need To Visit you will be well prepared to visit the country of your dreams ! Buy this book today!